When pushing "Create Branch" button on a JIRA Issue, it would be nice to configure the branch name to have a default prefix (like features/ as per gitflow). Thanks for commenting, voting and watching this issue. The team has now shipped branching model support for all Bitbucket repositories. To avoid unwanted surprises existing repositories do not have the feature enabled by default so you’ll need to enable it in the repository settings to enjoy the benefits. New repositories will have the feature enabled by default. When enabled, the default branch type names are set to Bugfix, Feature, Hotfix, and Release. These can be individually turned off, or edited, to match your naming convention. Choosing the Other option will not prefix the branch with one of the configured branch types. Further details are available in the documentation at branching model. We trust this will better support your teams process. This is the first step to help your teams work with branches more easily, so we'd love to hear your feedback. This feature is extremely important, spent an entire day trying to figure it out. Now forced to move to bb server. Oh, so much inconsistency between server and cloud ... ! I can understand that cloud has more advanced features than server editon, but not less! This is really something that need to be added. This is a very important feature. I'm considering switching to Bitbucket server to get it. The integration with JIRA is especially interesting! I didn't understand why this feature not included in cloud version yet. +1 for importance. Hi, I saw this issue is OPEN, is there any date for a release? +1 for importance too! +1. Cloud should be powerful as server version. It is very strange that BB Server and BB Cloud have different functionality. What is the development status of this issue? Looks like there are no any actions from Atlassian team since the issue was opened. +1, it will really help getting the workflow right. +1. This would make the live of our developers so much easier. Can we have a ETA for this? +1. It would be nice to see ETA. +1 - This feature would be very useful to achieve a branch naming consistency and also the JIRA integration is very helpful. +1 our whole team would wait for this feature! +1 kindly publish the release date, we are waiting for this.. Thanks for your interest and enthusiasm around this feature. We definitely agree that it's very useful and is something we'd like to bring to Cloud at some point, but at this time we do not have an ETA. We'll update this issue when we have more information. So of course I get to a new team and swear this feature is awesome. And then realize that they have cloud instead of server (where I had grown used to this awesomeness) and now I make the sad face. Come on Atlassian. Ive spent my entire career watching you guys miss the target on important features on the server. And now that everyone is moving to the cloud? Another round of "we'll get to it?" Sheesh. Really should have this in BitBucket Cloud. Issue #13259 was marked as a duplicate of this issue. +1, waiting for it.. or do we? I am hoping to see this feature available on cloud soon, this is very important to use git workflow. +1 as well. This is really important for automatic merging. When you have several release it starts to be a pain. Still no ETA year after? Branching models should also be in Cloud. Surprised this is not in the cloud. We moved from server to cloud and need this feature! I am surprised to see this ticket is still open after a year, any ETA or is this something being considered to be resolved? Thanks for your interest in this feature! This is still in the backlog, but it's lower priority than other projects at this time. We'll update this issue when it's going to be worked on. How do I leverage the pipeline and JIRA without this? What I want to do is when ticket closed, code marge to staging branch and deploy to staging server. Wow this is crazy, it was one of the factors for wanting to migrate my team away from Github and now I find out that this feature doesn't even exist for cloud. This is a very important feature for our team. I'm stunned that BB Cloud doesn't support this, especially as there's a section devoted to it in the help docs and it's clearly an essential part of most teams development lifecycle. quoting Aaron above, I can't believe that BB Cloud doesn't have this essential component when it's heavily supported in BB Server and used by most dev teams. We're just completing our move from BB Server, and it's pretty devastating to discover this missing functionality. Now I'm worried about what else we are going to find isn't supported. @Alastair Wilkes : You say it is not a priority? What about customers priority? Can you explain why it is not supported in BB cloud, when it is supported in the BB server? it's about time to have this in BB Cloud. I've migrated away from Atlassian Cloud products. There are a lot of problems like this throughout their cloud products. Stick to server until cloud is ready for actual production use, cloud seems more like a beta to me. Are you using server or moving to a different product? If they are not supporting cloud we should think about a different product. +1 please! This only like the 10th highest voted request. +1 - Pretty interesting decision to leave out something so integral to git workflows... Definitely cramping our team's workflow. I would have thought that this would be prioritized over 'style changes'. Also, +1 for reasons we're considering Gitlab and JetBrains tooling. Hey Folks! Surely this feature is needed to support seamless Jira & Bitbucket git workflow model in my, and any other, team. I've just come across this issue after ages searching for the feature. I guess there are work-arounds, but they are, well, work-arounds. Seems odd that it didn't make it from the server to the cloud. Looking forward to seeing an ETA. +1 Definitely an important feature as branching models are. In the trial right now and sad to see this isn't in the cloud version. 1 1/2 year and no progress on this missing feature? Is this seriously still not a feature of Bitbucket Cloud?!? We enabled GitFlow in SourceTree on some repositories then was very disappointed in finding out that it is still not supported in BitBucket Cloud when we try and create branches from JIRA tickets. +1 whole team needs it. +1. This would be a major improvement, and our team could really use it. +1 : very useful ! +1 Please add because I have used it on server version past year, but after switching to cloud version the option is not there any more. Thanks for your feedback on this ticket. We review our highest voted issues regularly, and have just completed this process again. Please continue to follow this ticket for updates, and add comments describing any use-cases that are important to your team and not already covered above. Seriously? This is the only reason our organization hasn't migrated to bitbucket. Can't you just start with Git Flow? It is available on you Server version, wouldn't it be a simple copy and past. Or make it possible to just define a list of branch types yourself? You can, if you don't use branch permissions that disallow you to push directly to develop/master. 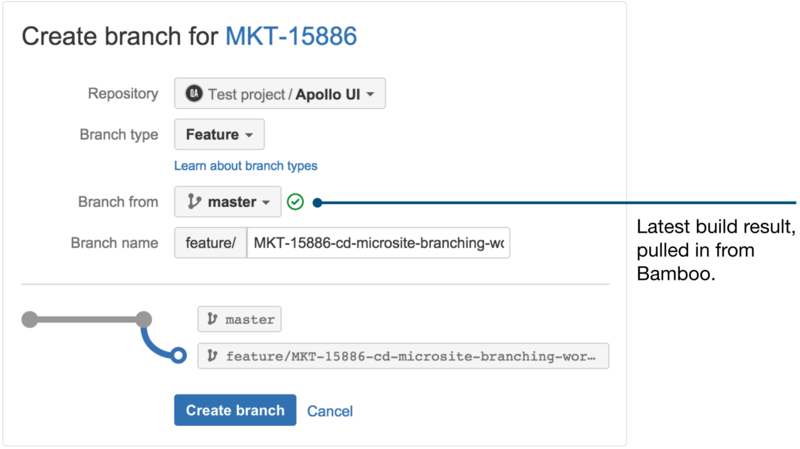 Therefor; if you also use JIRA, it can be useful to create the branch from a story or task. Bert, that is how we create branches, but in the Cloud version I have not yet found a way to show a dropdown list so I for example can make a feature/name, version/name or release/name branch from Jira. I can only select from where to branch from. Currently I need to add feature/ myself infront of the branch name created by Jira. I the server version this is possible with branching models. Issue #8216 was marked as a duplicate of this issue. Issue #15643 was marked as a duplicate of this issue. Could we please get this? This would make life a lot easier for the devs. Please add this feature to Bitbucket Cloud. We really need it. +1 to this feature, I Would love to have this awesome feature on BB Cloud. ... Still waiting for this. Nearly 2 years and this feature is still not in BB cloud? We're investigating if we can migrate to self-hosted GitLab. BB Cloud definitely was the wrong decision. seems to be not a complex thing to implement, especially if it's already implemented in BB Server code. It's really deceptive advertising that the feature comparison between the Cloud, Server, and Data Center products on the Atlassian product site makes it look like Cloud has a superset of the Server features, but it actuality, Cloud is a completely different product that's missing this feature, along with many other desired features from Stash/Server, like automatic merges and a tree view for diffs. These distinctions should be made clear; otherwise people may make the mistake of evaluating Server and then choosing to go with Cloud for pricing or ease of maintenance reasons, expecting to get (at bare minimum) the same feature set. The tree view for diffs being missing is incomprehensible in my opinion. We're left with a giant vertical scroll between us and a decent pull request review... That said, I feel your comment is spot on. We are now hosed and having to find time to spend converting over to a different product rather than working on OUR product. It seems they value extracting and productizing crucial features more than they care about usability. When is this going to be implemented ????? This is something that my team, and I am sure a number of others, would cause to switch to another product/solution. Too bad @Martin Jopson already replied that Atlassian isn't going to implement this (one of the most wanted features) right now. This is so needed! +50 from me and the whole dev team. +1 I can't believe this isn't implemented BB Cloud.. This must be one of the most useful features there is! +99 It’s completely lunatic in my dev team opinion that this is not part of BB cloud yet. This is really an important feature which should be added to bitbucket cloud. We use both cloud and server version and there is inconsistency across the features and alot of things we can't do with cloud version. @Martin Jopson, this is the 6th highest voted issue. If you add in the votes from the issues that duplicates this one, it falls in the number 3 slot. It's fully part of the "Integrations" section - #8216, which was marked a duplicate of this one, relates to creating branches from JIRA. It's a feature that apparently works in BitBucket Server. You may review your highest voted issues regularly, but the top 8 issues are all several years old. Heck, this one is almost five years old if you use #8216 as the start date. On the entire first page, nearly every issue is 4+ years old. This is a strong indication that you don't actually care about the highest voted issues. All this issue is asking for is the option to configure the name pattern when creating issues from JIRA (or other linked product). It's not a massive re-architecture - it's a regex and a configuration value in the settings. All these dedicated users asking for a feature. and the only thing you come up with is an auto answer... i give up. Take a serious look at what your customers are asking, that is how you run a good business... If it the decision were up to me at my workplace, we would not be using this product due to things like this. I am hoping to be proved wrong soon, but based on some replies I have little faith. Thanks @Robert Watkins for looking into the correct statistics. @Martin Jopson , I just can't understand why such a minor change can be constantly postponed, but has a enormous value to a lot of customers. This issue can be fixed easily be fixed just as @Robert Watkins proposes with a simple configuration of the value under the project settings. It is voted so high that it can easily be added as a sprint filler. It is really a shame that we as well-invested customers are not taking serously. Totally agree. This is unreal. I don't understand this at all. Here are active, paying users taking time out of their own day to give valuable feedback to improve your product. Obviously Atlasssian/Bitbucket doesn't value their customers feedback (or time) as much as they say because if they did this issue that is almost 2 years old (and one of the top suggested features) would have been acknowledged and resolved. +1 for @Chris Diana, @Robert van Mölken and @Derek Rosien. We're currently doing the migration to gitlab (on site) as there are other features we'll probably never see in BB cloud. there shouldn't be a difference between both products in the first place. You are hosting one product and the other is hosted by us. That should be the only difference. So your top priority should be to keep both products in sync (or just use the same for both). It's ridiculous to even argue about this. I didn't even realize this was a missing feature until we had already committed to using bitbucket cloud. Had I known this was missing, we would have gone somewhere else. Even though we're sticking with bitbucket cloud for now, we decided not to invest in Bamboo for our CI needs to make it easier for us to separate in the future. @David Wahlandt - BitBucket Server is literally a different product to BitBucket Cloud. BitBucket Cloud is the original, acquired by Atlassian several years ago. They then acquired another product (I forget the name), and reskinned & rebranded that as BitBucket Server. It already had this feature, so they kept it - but they haven't put it into Cloud. That's a big reason why there are feature disparities between Cloud & Server. The lack of this feature isn't the end of the world. It's easily worked around - it's just annoying as hell. @Robert Watkins I wasn't aware of the history, but i know that these are two separate products. Either way, and especially because they've changed the naming of Stash to make it more closely related to BitBucket, there should be no difference in features between the two. Otherwise they should have kept the old name to distinguish them. With the current names you just expect that BitBucket Server is exactly the same as BitBucket except that you are going to host it yourself and that is not the case, not only with this feature. Currently the 5th highest open enhancement task. Please keep upvoting this people! I was amazed to find out this is not implemented. What's the point of using git-flow if your tools don't assist you with it? I still haven't committed to bitbucket yet, since docker gives two choices between github and bb, i might just end up switching to github if it takes 5 years to even consider this as a feature by the devs. just tried to get this feature running with Jira and Bitbucket Cloud mentioned here Continuous delivery workflows with the branch-per-issue model. Especially this image triggered me to keep trying it. Finally found this here. Please, with a cherry on the top, make this possible in BB-Cloud! Issue #16616 was marked as a duplicate of this issue. Issue #16606 was marked as a duplicate of this issue. Thanks for voting, watching and commenting on this issue. [updated] The team in Sydney are currently looking at this enhancement and have now scheduled time with a number of you to better understand needs, expectations and how these teams work. Even better if such mapping was configurable. How did anyone came up with the idea of having a cloud version with limited functionalities. I have no other option than unsubscribing and move to a competitor who better responds to customer requests. As this enhancement is now in the top three votes when cvan we expect it? In the next (couple of) sprint(s)? @Asiri Dalugoda - Tip! The button to fork a repository is available under the "+" menu in the blue global left navigation bar when you are viewing the repo you want to fork. Thanks for the heads up ALastair. that was a tricky location to find it. Thanks heaps. It's really not cool to tell our developer "Every time you create a feature branch please remember to put the prefix 'feature/' in front of it". The team are currently working on this enhancement, further details including its availability will be added here in due course. Except the enforcement that Prefix for branching types may not overlap means that we can't use it with the standard git flow model, where bugfix and features are both /feature. If we did change to these distinct prefixes, it would also mean defining new Pipelines for them, when we treat them the same for a "feature" pipeline. Put another way, we want Story and Bug issue types in Jira to both map to /feature. WooHoo! Thank you for listening and implementing this feature. Already turned on and working! Thanks for this, very happy that this feature is finally available. turned it on and it works! I am SO happy this has been implemented !! In fact, I'm so happy, that my mood has improved significantly. Due to this, my colleagues get free coffees from me, and I now compliment them for everything and nothing. While driving in traffic, I'm not a prick anymore. I wait patiently in line and let other people go in front of me. My wife is now back with me, because I have no anger issues anymore and my dog is not afraid of me anymore. This change has affected my life dramatically, as you can read. My manager thought I won the lottery or something, but no, applying a branching model makes me very happy. All that remains for me to say is: THANK YOU! @Chris Seegers, you sir just made my week! @Martin Jopson , I can't figure out how to get the mapping to work. Is a specific version of Jira Software required? @Allan Hsu You configure the mapping of issue type to branches in Bitbucket (using Bitbucket issue types) on a per-repository basis. You get to it from the Settings panel for the repository. It would have been nice if this was able to be configured on a project level - I'm currently going through a few dozen repositories for my main project to configure this. Thanks alot for implementing this. Thank you for finally implementing this!! Thanks all for your feedback on the release of the feature/enhancement. @Chris Seegers - that's quite a reaction! @Ben Tatham + @Derek Rosien - did you create a workaround for the current implementation? I am planning to close this issue soon and track additional/related requests in separate issues. This will allow a more focussed understanding of any remaining requests and enable better prioritisation for our team. @Martin Jopson - No, as best I can tell, there is no workaround to make this work for standard git flow. To reiterate, my request is just to allow "Bugfix" and "Feature" to both map to feature/. (Or perhaps a way to map the branch types Bugfix and Feature to actual Jira types of "Bug" and "Story" - if we could map both jira types to "Feature", that would work, but I haven't seen that configuration option anywhere, which I imagine is also a problem if people have custom jira issue types). Also, I tried just not enabling Bugfix in Bitbucket settings, but then Create Branch from Jira auto-chooses "other" with no prefix. So not much better off than before -- just that instead of typing "feature/", I can choose from the dropdown for "Type" on the Create Branch page in Bitbucket. The team are currently looking at better supporting standard Git Flow which does not use Bugfix branch type. Currently Bug issue types (via Jira) map to the Bugfix branch type. If the Bugfix branch type is disabled (unchecked) then the mapping is to Other (no branch type, manual entry of any prefix). The solution we're considering is to change the mapping only in the case of the Bugfix branch type being disabled (unchecked) and the mapping for Bug issue type would be to the Feature branch type. In the case of the Feature branch type also being disabled both Story and Bug issue types would map to Other. This seems like a simple and clean solution which can serve the needs of those using Bugfix branch type and also support those doing standard Git Flow. However, this change could potentially disrupt users who wish their Bug issue type to continue mapping to Other (when Bugfix is disabled). The solution would require these users to manually change from Feature to Other in this case to retain their process. We'd like to hear from anyone who would be negatively impacted by this solution and understand their use case. The team have now shipped an update to the branching model functionality that will map Bug issue types to Feature branch type when the Bugfix branch type is not enabled. This should help your teams to follow a standard GitFlow if desired, which does not have a Bugfix branch type and which will map both Bug and Story issue types to the Feature branch type. To take advantage of this update navigate to the repository settings / branching model and ensure that Feature branch type is checked and Bugfix branch type is unchecked. I will now close this issue. The team have now shipped branch permissions based on branch types. This means that branch permissions can be set for either a name, pattern or branch type. This simplifies setting the branch permission for a branch type and also helps keep the permission in sync with any changes.